This is the 3rd book in the White House Chef series. I have previously reviewed the first two books: State of the Onion and Hail to the Chef. Ollie Paras is back, and she’s just as fabulous as ever. 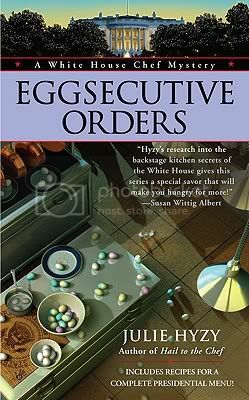 In Eggsecutive Orders, we see much less of the White House and the White House kitchen, because Ollie herself gets kicked out of her kitchen in the first few pages of the book. The night before the book begins, the President hosted a dinner that included the Joseph McCarthy of terrorism, the NSA’s Carl Minkus. Minkus has made plenty of enemies, so when he dies after dinner, the Secret Service suspects foul play – and the food service – immediately. Julie Hyzy does a fabulous job keeping Ollie’s adventures fresh. I was initially a bit worried about how Ollie not being in the White House much would play out, but Hyzy added two new characters to the mix: Ollie’s mother and grandmother who were on their way to visit her from Chicago when the crisis comes to a head. To spice things up even more, Ollie has once more been prohibited from sticking her nose into the investigation, but this time her Secret Service boyfriend Tom is essentially a hostage to ensure her good behavior. He has been put in charge of keeping her in line, and his job depends on her staying out of trouble. Although I really like Hyzy’s Manor House series, I had forgotten just how much fun the White House Chef series really is. Ollie is a fabulous protagonist: smart, sassy, and occasionally prone to embarrassing herself (but not too much). Even better, she’s just as engaging three books into the series as she was at the beginning, if not more so. This series is an absolute joy to read, I highly recommend it. I know I’m looking forward to the next books in the series: Buffalo West Wing and the newly-released Affairs of Steak. All Grace’s life, she has dreamed of working at Marshfield Manor. She is finally the assistant curator and at this point, it is really the only thing she has going for her, after losing her mother to cancer and her fiance to someone else in quick succession. She loves her job and her roommates, even if money is still a bit tight and the roof needs replacing. All things considered, things are going well over all. Until, that is, the head curator of Marshfield Manor is killed in the private quarters during a disturbance downstairs. Now Grace must step into two new roles: running the manor as head curator, and trying to solve a murder, before anyone else is targeted. Grace is a fabulous character, tough, yet vulnerable. Great at her job, but a little bit hopeless in her personal life. She is so engaging that I fell immediately under her spell, completely identifying her and rapt by the things that were challenging her. The mystery itself was well-constructed, with sufficient clues that I did not feel the answer came out of nowhere, but enough intrigue and suspense that I did not guess the perpetrator before Grace did. I very much enjoyed the first two books I read in Hyzy’s White House Chef series, but good as they were, I think that Grace Under Pressure is that much better. I can’t wait to read the next book in the series, Grace Interrupted which is out in June of 2011. After a grueling encounter with an old rival and a dangerous encounter with someone who was not who he seemed, Ollie Paras has finally realized her dream of being Executive Chef of the White House. However, if Ollie thought that things – out of the kitchen at least – would calm down once she was in her new role, she was dead wrong. Just in time for the busy holiday season there are mysterious and deadly occurrences everywhere Ollie turns: from mysterious deaths to fake bombs being planted in the White House. Now Ollie has to worry not only about the menus and staffing for some of her biggest events of the year, but she also has to find time to squeeze in mandatory explosives-recognition classes as well as some highly unofficial sleuthing. I cannot think of much that is more fun than spending time with Ollie and her kitchen. She is smart and relatively confident and not afraid to stick her nose where it doesn’t belong. Hyzy did a good job beginning to grown Ollie into her new role. She is noticeably more comfortable with it than in State of the Onion, but not so much that it seems unreasonable for her given the amount of time in the new position. My only slight problem was with the resolution of the mystery. It was perhaps a bit more complex than I would have guessed and I thought it was perhaps a little much. Other than that, though, Hail to the Chef was a thoroughly enjoyable read. Yesterday I reviewed the first book in Julie Hyzy’s White House Chef series. The fourth book in this series, “Buffalo West Wing,” was released earlier this week and I ended up with two copies from the publisher, so I thought I would share the wealth and give one away to one of my fabulous readers (the other one is staying firmly ensconced on my shelf until I have read books two and three and I can get to it as well). I haven’t had a chance to read “Buffalo West Wing” yet, but I would be surprised if it was really necessary to read the first three books first. The sense I get from Hyzy’s writing is that she is the kind of author who would catch up her readers quickly. I really enjoyed “State of the Onion,” however, so I would say that it would be worth winning “Buffalo West Wing” and picking up the others (they are mass market paperback and cheap!). Because I am sending this out myself and it is a nice little lightweight mass market paperback, I can open this contest up internationally. Please fill out the Google form below by Friday, January 14th at 11:59 pm Central (US) and I will choose a winner that weekend.